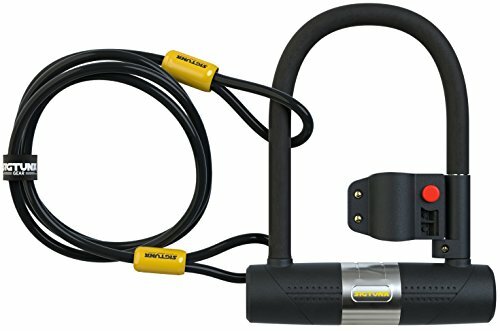 Via Velo Corrosion Resistant Bicycle Mount U-Lock with 2 in 1 Lock System, 10mm thick by 6 foot long cable Seamless security and added protection are yours in all weather conditions, anywhere you go. Our Via Velo 2-in-1 lock system, with pick, pull and drill-resistant double bolt locking mechanism and debris cover, combined with a braided steel cable, brings convenience and performance together. Includes a handy mounting bracket and 2 specialized safety keys. 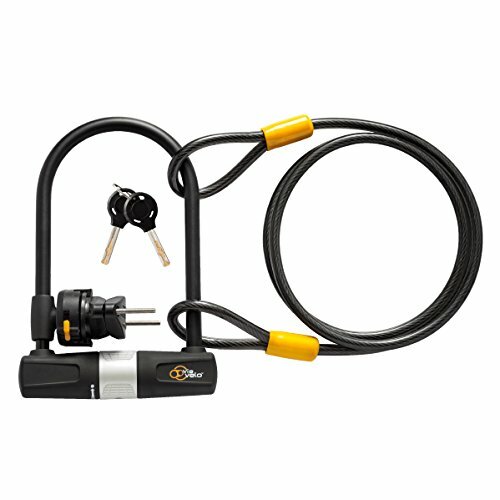 Features: PREMIUM THEFT DETERENCE - Pick, pull and drill-resistant lock cylinder provides ultimate protection. Enjoy greater freedom and protection while cycling. LONG-LASTING PERFORMANCE - A superior all-weather U-lock featuring corrosion-resistant construction for better performance year round, no matter what the weather brings. LOCK DEBRIS COVER FOR LONGER LIFE - Keep dust and dirt out of your lock to keep your product in top shape wherever you go. MAXIMUM DIMENSIONS FOR MAXIMUM SAFETY - 7.5in X 14mm U-lock + 180cm x 10mm cable provide flexible lock use, whether for bike, scooter, bike parts or trailer..
EASY TRANSPORT - Convenient mounting bracket ensures safe and compact storage when cycling; no need to pack your lock in a separate carry case or knapsack. Make your trip hassle-free and easy! BUILT-IN FEATURES THAT STAND OUT - 2-in-1 system locks both wheels and frame. Keep your bike, scooter or trailer stationary with our specially designed systems suitable for all terrain. DUST COVER: The combination is covered by a dust cover to protects and extends cylinder life. LOCK SIZE: 8.96(Length) x 5.74(Width) x 0.624(Thickness) - PLEASE NOTE: Manual measurement for reference only. AMAZER GUARANTEE: If you have any problem with the AMAZER Bike U Lock, please don't hesitate to contact us. We will offer friendly customer service. 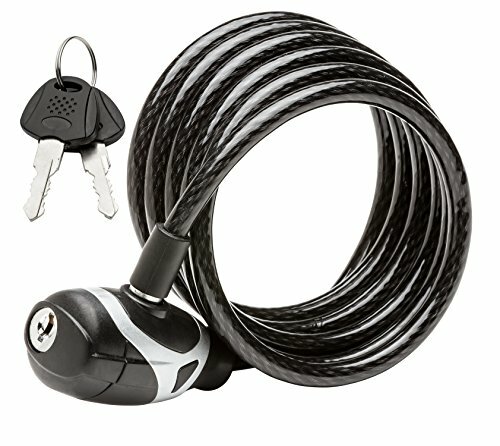 The Schwinn 6" X 8MM coil cable key lock provides the ultimate in security. The heavy duty 8mm braided self coiling cable is easy to use and store on your bike to commute anywhere. The keys make this a simple way to operate this lock. DURABLE CUT RESISTANCE CABLE: This bike lock cable is made from 0.27 inch extra thick manganese steel for cut resistance and protective zinc-plated coating to prevent from scratching. EASY TO SET/RESET: Easy to set and reset your own personalized number combination. LONG FLEXIBLE CABLE: This bike lock is 3.2 feet long, ideal for bicycles, bike, ladders, lawnmowers, gates, fences, tool boxes, bbq, sport equipments and etc. WATERPROOF & DUSTPROOF COVER: A flexible cloth sleeve which covers the chains to protect it from being scratched and sawed, long lifespan. 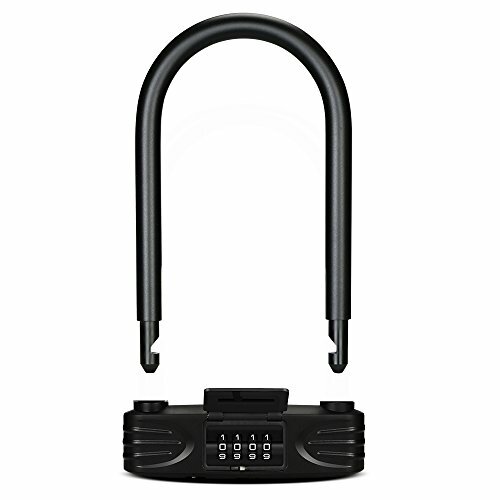 With 850+ 5-star reviews here are 5 More Reasons to BUY your 16mm Heavy Duty Bike Lock U-Lock TODAY: 1.) Tested and 'Tested' - Not only do we lab-test our bike locks, but we give our bicycle locks a serious GO ourselves as well. Fun ensured! 5.) Durabililty - With a Hardened-Steel U-shackle, a sturdy Mounting Bracket and a braided Bike Lock Cable this bicycle lock will protect your bike season after season. . SIZE DOES MATTER - Our Bicycle Lock model Wodan is made of 16mm Hardened ABS Steel. This thickness outperforms almost all bike locks on the market. It is certified against a wide range of attacks and the Double Bolt Mechanism is designed for extensive holding power. With this kind of protection, you will be sure that your bike is safe (and you can enjoy more rides to family and friends!). GO FOR EASY LOCKING - The Mounting Bracket Holder is easy to install with our instructions and with just one push on the Quick-Release Button the U-lock can be released from the bracket. This enables you to quickly take and store your bike lock when out on a ride (so that you can enjoy your day!) and with 3 laser-cut Keys, you will never have to worry when you lose one. WARRANTY AND SERVICE - If this U-lock is not the favorite you ever owned - some say it is heavy, but that means it is secure - just return it and get a full refund. No questions asked, you can rely on us. We stand for our products, so all our products come with a 3-year guarantee. Our customers love that, we know you will too. 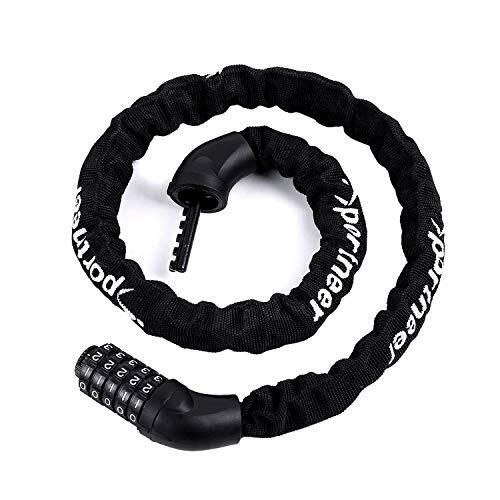 CLICK ADD TO CART Don't wait any longer and choose this Heavy Duty 16mm Bike U Lock with Security Cable plus Mounting Bracket to protect your bike and enjoy more awesome bike rides knowing your ride is secure season after season. 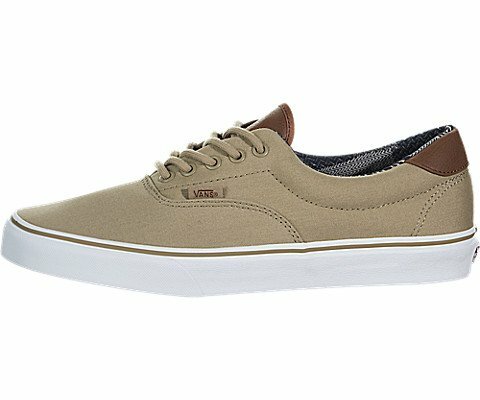 Enter code SAVE1916 to get 10% off when you buy two! 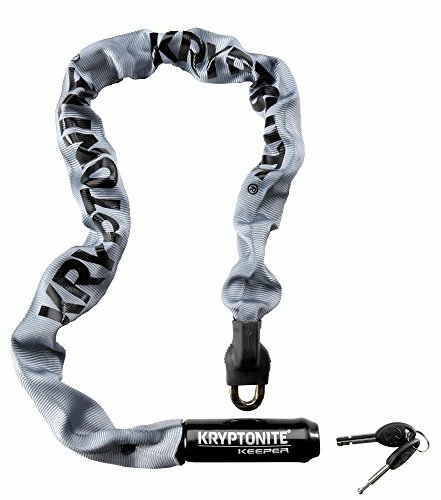 The lightweight Kryptonite Keeper Integrated Chain is made of hardened 3t manganese steel formed into 7mm four-sided links. Recommended for use in low crime areas. 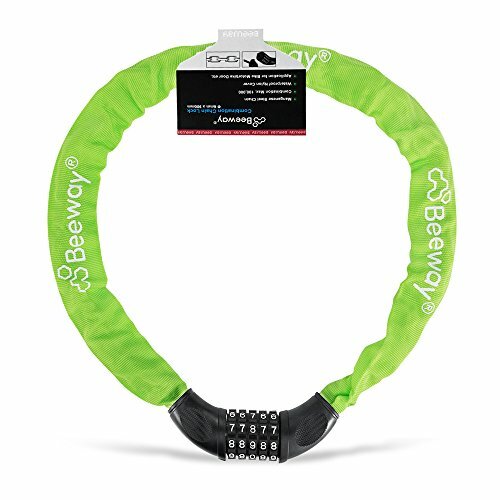 The Beeway 5-digit resettable combination anti-theft chain lock is a perfect solution for protecting your bicycle, motorcycle, ATV, skateboards, sports equipment, gates & fences, grills & lawnmowers, tools, tool boxes & ladders, generators, hand trucks, scaffolding, or other valuables against theft. And conveniently it comes with one handy solution, 5-Digit resettable combination locking mechanisms for maximum anti pick resistance and keyless convenience. Set-your-own password combination. Easy to set & reset. Heavy duty tough square-linked, hardened steel chain for strong cutting and sawing resistance. The cable is 90cm long, large enough to lock up ladders, bikes, gates, fences, grills, tool boxes and other items that need to be secured. The preset code is "00000"
6. Repeat the 1-5 steps above to reset the code anytime you like. Once forget the password, you can never open your lock. Please remember your password if you have set a new one. COMBINATION: Set-your-own combination bike lock. 5-Digit combination for maximum 100,000 anti pick resistance. Resettable combination locking mechanisms for keyless convenience. Easy to set & reset. SAFETY: Heavy duty tough square-linked, hardened steel chain for strong cutting and sawing resistance. ADDITIONAL PROTE: Nylon sleeve cover provides additional protection and helps prevent scratching. SIZE: 90cm long x 3cm diameter. Item weight 770 grams. APPLICATION: Ideal for bicycle lock, motorcycle lock, combination lock, cable lock, chain lock, skateboards, sports equipment, gates & fences, grills & lawnmowers, tools, tool boxes & ladders, generators, hand trucks, scaffolding, and more. 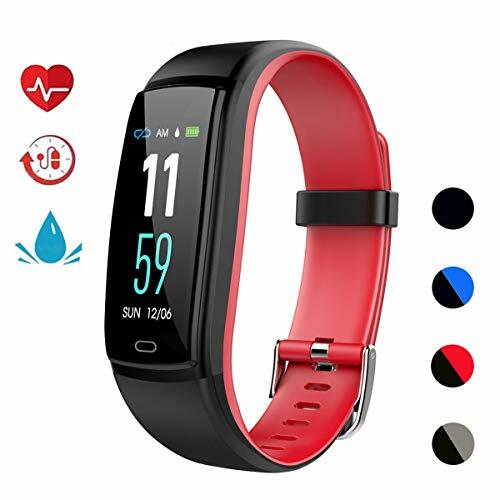 Smart Function Fitness tracker, Heart rate monitor, Blood pressure monitor, Sleep Monitor, Pedometer, Calorie Counter, Step Counter, Bluetooth calling, Phone call reminder, Caller's name display, Caller ID display, Reject answer the phone, Message reminder, Health tracker, , Sedentary reminder, Wechat Sports, Remote control function , Remote Camera, Alarm, Countdown, Stopwatch. Longer Battery Life & Compatibility Full charge requires only about 1 hour and the standby time can be 5-7 days.App supports smart phones with Bluetooth 4.0 or above(not for tablet).Support system:iPhone (not for iPad) iOS 8.0 above,Android 4.4 above(The app not support Samsung J3 J5,Sony Xperia Z3 XZ Premium). Customer Service 7*24H email reply,60 days replacement or refund,Lifetime warranty.